Freshwater tanks tend to have a wide variety of fish species living together. 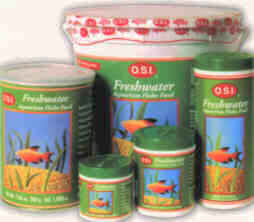 OSI freshwater flakes have a broad spectrum of vitamins and nutrients to meet the needs of a diverse community of troical fish. Goldfish are less active than other types of fish. They also have stomachless gigestive systems. 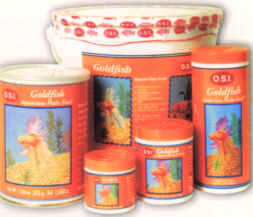 OSI Goldfish Flakes are formulated with less protein and fat and with more plant fiber than other diets to keep fish weights down and digestive tracts healthy.